Hitting Homers For Families In Need! Kenny and Kira are the parents of two beautiful boys. Their youngest son, Ciarlo (6 yrs. old), has Spina Bifida. His older brother Dominic (8 yrs. old) was diagnosed with Glioblastoma (Grade 4 malignant brain tumor) on March 7th 2016. Both boys are sweet, happy and despite their huge physical battles, still love everyday things like Legos, our Philly sports teams, having fun and just being silly! Kira and Kenny work immensely hard every day to provide so much for their boys. Not only financially, but emotionally, taking them to treatments and, in Dominic’s case, spending weeks in the hospital for surgeries, chemo and radiation. 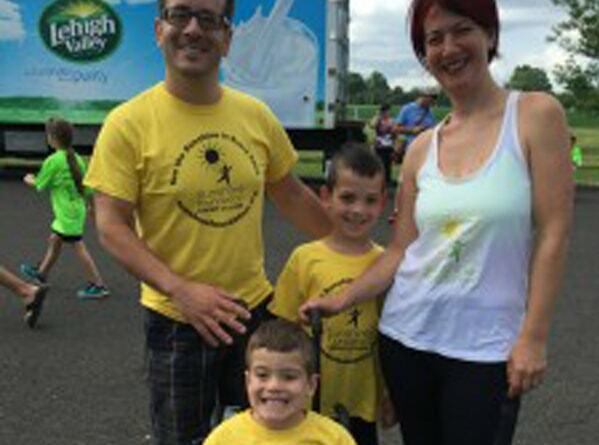 This family has already been through so much, and Kira has always been one to take the lead and help fundraise for Spina Bifida – now they are the ones who could use some help! We are heartbroken to report that Dominic’s battle with cancer ended exactly 9 months to the day of his diagnosis. On December 7th 2016, Dominic went to live with Jesus in Heaven. Homers For Hope extends our deepest condolences to the Liples family during this time. So far, Homers For Hope has been able to pay for: an emergency septic repair bill, 2 car repair bills, a dental payment, and 10 months of mortgage payments. Additional bill payments are pending. At Homers for Hope our mission is simple: Hit Homers for families in need. The proceeds from our events are used to pay the everyday household bills for families suffering from a tragic event or illness. Homers for Hope has grown to now hold networking events, business luncheons, baseball clinics, softball games, softball tournaments, baseball exhibition games, Baseball and Softball Home Run Derbies and more. Homers For Hope © 2017 All Rights Reserved.